No two positions are the same, so whether you are new to your executive position, or taking on a different role, the simple act of assessing your approach to the new role is imperative. As I’m sure you know, today’s business environment is more complex with fiercer competition, scarce resources and higher workforce expectations. Leadership isn’t getting easier; it’s getting more challenging. So when you start a new position, you want to start strong. Available for immediate download is Executive Leadership Consulting’s assessment for any executive in a new role. 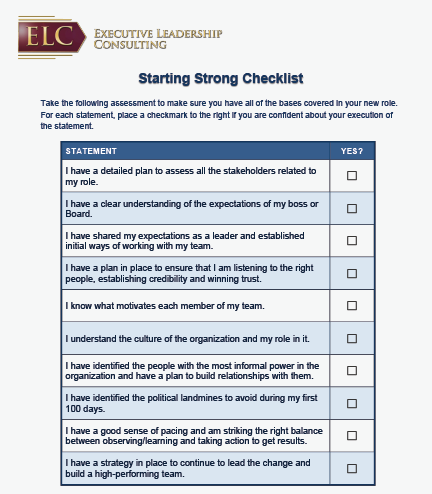 Simply click the button below to open the “Starting Strong Checklist” and begin self-assessing your progress against the essential factors for you to Start Strong.